HOYA Lenses Giveaway | A Savings WOW! Grand Prize: A HOYA Lenses voucher for you and one to give to a friend! Each voucher is good for a pair of HOYA eyeglass lenses with Super Hi-Vision EX3 anti-reflective treatment. Each voucher is worth more than $100 and depending on the winner’s prescription much more than that! 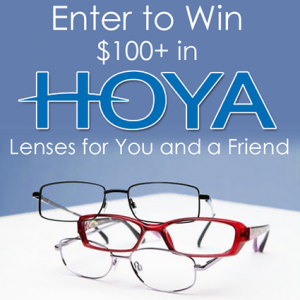 You can use your voucher at an eye care provider that works with HOYA near you. Are you looking for the best eye glass lenses and vision correction for you and your family? HOYA has been in the optics manufacturing business since 1941. They hold more than 1,700 patents and work hard to bring you the best vision correction possible. As a manufacturer, they supply their lenses to independent eye care providers, the eye doctor or optical shop on Main Street in your town. They do not sell their lenses to chains, big box retailers or over the Internet. Their lenses are designed to bring you the best possible vision and treated to provide the most scratch resistance available on the market. HOYA lenses are also available with Transitions. With tablets and smart phones an integrated part of our lives, they also offer Sync lenses and Recharge anti-reflective (blue light blocking) treatment to help you avoid the headaches, blurred vision and fatigue that are associated with overuse of devices and Computer Vision Syndrome. They are very active in the blogger community, host Twitter parties and support other friends of independent eye care such as “Jillian’s Story.” Let them help you find your local independent eye care provider today! Check out a great HOYA Lenses Review from Saving You Dinero.